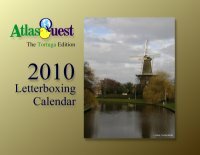 The official Atlas Quest 2010 Letterboxing Calendars are here! I have two calendars this year--the usual, run-of-the-mill original style calendar with photos taken by letterboxers from all over the place. But I've made it available for anyone who would like it--the photos are pretty good, I think! I'm also doing things a bit differently this year than in past years. In years past, I would collect a bunch of calendar orders then order them in bulk, exactly the number of calendars I need. This time, I'm still ordering calendars in bulk--but I've already ordered them. Ordered them this morning, in fact. So rather than taking an unlimited number of calendar orders, the number of calendars this year are limited in quantity. Just 100 of the "original style" calendar, and just 10 of the "Tortuga edition." When they run out, I won't be taking anymore calendar orders. Eventually, I'll get them online so you can order them directly from lulu.com, but they'll cost more there and probably not until October at the earliest. If I used one of your photos in the calendar, I'll be sending you a free calendar. Don't include the free one in your order if you wish to order additional calendars. I'll contact each of you personally about how to get your free calendar. And remember--Atlas Quest is always ready to take more photo submissions for the 2011 letterboxing calendar. Just go to the Project X page for rules and the submission form. NICE calendars! Hard to choose but decided to grab one of yours. EXcellent photos! OK did I miss the rice somewhere? Kay ... if you click on Order Now, the price comes up as $14. Mine arrived yesterday...it's great! Thanks, Ryan!